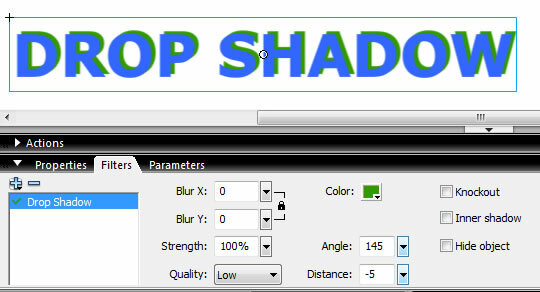 This tutorial will teach you how to create a drop shadow effect in Flash 8. Flash 8 has 3 drop shadow effects, i.e. inner shadow, knock out and drop shadow. You will learn how to create these effects in this tutorial. First, open a new Flash document in Flash 8 and use the text tool to write some sample text. Now convert this to a symbol by choosing the text clicking on Modify > Convert to Symbol... Give the symbol a name and click on ok. Choose the symbol and click on the Filters tab which is next to the Properties tab and use the plus (+) symbol to choose the Drop Shadow filter. You will see the Drop Shadow Filter options as shown below. Here you can change the drop shadow color, angle, distance, blur etc. Try out the options to see the changes. Example of a drop shadow effect can be seen below. You can also use Knockout and Inner shadow for different effects. See below.